Recently, my bf's sister had a trip planned to Phuket but did not know what to do there. Since I'm trying to venture more into travel blogging this year (one of my 2018 resolutions), I thought it'd be a good start to blog about my trip to Phuket, Thailand 2 years back (yes, seriously 😂). I'll try to keep it short & sweet and it will mainly be a photo-heavy post.. I'll be sharing with you where we went, sights to see and most importantly, what food to eat! Hope you'll like it! PS: Read till the end to see how you can score some cheap flight tickets for flights from Kuala Lumpur to Phuket! Let's get the question of WHERE WE STAYED out of the way first. We booked a really affordable hotel called Sira Grande Hotel. To our surprise, it was really cheap, clean and comfortable! The rooms were spacious, it was within walking distance to all the touristy areas and pubs (but not TOO close so it was still quiet, and has a decent rooftop pool area! If you are looking to book an accomodation, I would suggest choosing Patong Center area as it's near the food and night life area. There's even a mall, wet and night market, and boxing stadium nearby! Perfect location, lots of massage & nail parlours and everywhere is walkable so you can save on transportation. My dad has been to Phuket before, so he wanted us to try this grilled catfish from a roadside stall. The dish is called bplaa dook yaang. Omg it's SO GOOD because the fish is soft, fragrant and absolutely perfect when paired with the sour and spicy chilli sauce! Please try to find the auntie who has a moving stall right outside the Patong Walk signboard (I'm not sure if she's still there now but I hope she is because I STILL miss her grilled catfish omg). We also had the pork salad! Since it was just next to our hotel street, we went inside the Banzaan Fresh Market to see what they had to offer. Tbh, this is just a normal wet market to me but they do sell fresh veges, seafood, meats and dried foods inside if you're interested to buy some back. Btw, the Banzaan Night Market operates just outside this wet market at night. You will definitely see AND hear the Bangla Boxing Stadium as it's just opposite Patong Center and the Banzaan Night Market. We didn't get to watch a Thai boxing match, but I'd love to see it one day! Robinson Mall is just a stone's throw away from and opposite Patong Center. Here, you can find some international brands (don't expect super branded lah). Along that road near the mall, there are many small shops that sell quite cheap Thai souvenirs like tank tops, pants, hats, etc. I like to try McDonald's in every country that I go to to see what different menus they have. This time we only managed to try the banana pie, in conjunction with the Minion craze lol. It may be a modern mall, but outside there is a street selling trinkets and what not, kind of like Bazaar @ The Curve in KL. They also have many restaurants and bars here with happy hour deals. We decided to just have lunch at the mall. Can you believe we came all the way to Thailand and our first lunch was Spanish food at La Bodega. As if they don't have this in KL also 😄 But the paella was nice, so no complaints. Further down from Patong Center is Patong Beach. You will pass by Bangla Road on your way there. This is my favourite place as it's so happening! It comes alive at night with pubs, clubs and bars sobasically you will see many foreigners chilling here with booze. In the afternoon, there are also shops selling touristy souvenirs too, which is where my sister bought her elephant print pants and I got my hat and sunnies here for like 100baht lol. There are a lot of backpackers hostels here as well! Since this is a 'jalan-jalan cari makan' trip, we just stopped at any roadside stall/ pushcart that peaked our interest to buy food haha. Cannot miss my favourite coconut shake, Thai milk tea and som tam! Basically you can just buy the food and stand by the roadside to eat, feels more authentic lol. On the way to the beach, we found this food street in Jungceylon Mall and ate.. again. Lol. This time we just ordered a salted grilled fish like the one we usually eat in KL. Pro tip: If you wanna do some cheap shopping, check out Jungceylon area! It was almost night time when we reached the beach (we kept getting distracted by sights, photo-taking, alcohol and food 😂 The good thing about walking in the evening is that the weather isn't so hot. Anyway, we took a few photos at the beach before deciding to go look for Hard Rock Cafe. Basically we had no plans for this trip, just walk around and see what we can do or eat. Haha. My siblings and I always try to take jump shots at every country we go, so explains the photo above. As we were looking for the place, we passed by this mall called Banana Walk. There's nothing much there, but I remember there were some art shops that sells gorgeous oil paintings and a huge Billabong/ Roxy/ Quiksilver there to cater to surfers or beach lovers. My sister said she read about this restaurant online, so when we saw The Sweet Restaurant, we stopped inside and ordered some tomyam and prawn salad to try. The tomyam is not bad, but not spicy enough for me. The prices are quite affordable! More foooood. Saw these stalls selling the rolled ice-cream and banana crepe on the way back so we decided to order some. It's fun to watch how the rolled ice-cream is made! We finally reached my dad's must-visit place in every city lol. He signed up as a Hard Rock member so we got to enjoy a free cocktail before taking the tuk-tuk car back to our hotel. There are many famous foreign bars (Hooters, HRC, etc) and luxury hotels (Holiday Inn, etc) near this area and the place is just filled with music and booze. The next day, we booked a local tour guide from the hotel and decided to explore Phuket beyond our walking premise. Our first stop was the famous Big Buddha Phuket. Look at the beautiful Buddha! The area was actually under construction when we were there, but we still managed to get some good photos. The view from the top of the hill is quite decent too! Don't forget to wear something that covers your knees and shoulder btw, else you will be given these sarongs to wear inside the temple for more modesty. Since the temple was under construction, we could purchase a small tile and write our names on it for good luck. The next stop was Watchalong Phuket. I just realised my blog profile photo was taken at this place and since it was so long ago, it reminds me that it's time to update my pic 😂 It's a really beautiful temple and has many gold Buddha statues inside. 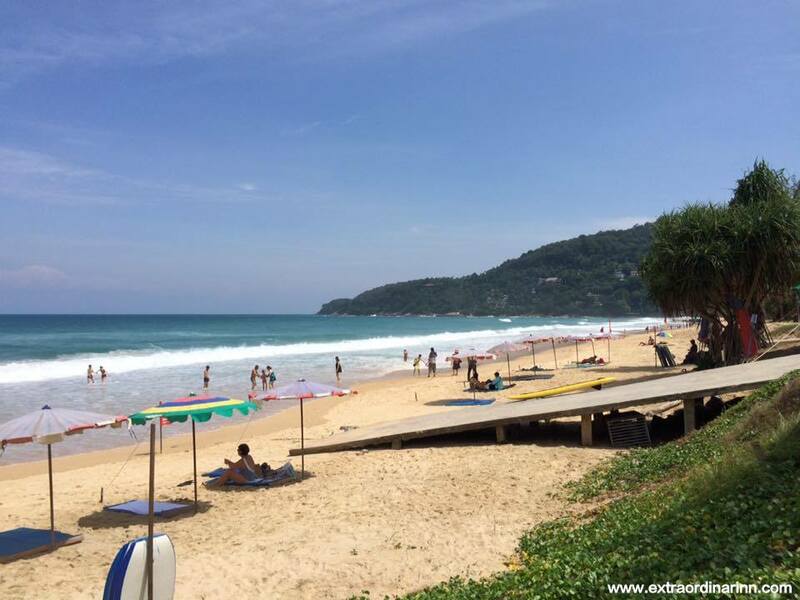 On the way to Old Phuket Town, you would pass by another famous beach called Karon Beach. The driver stopped us here for awhile to take photos. Our driver then brought us to Old Phuket Town. There's nothing much to see here, but it's nice to soak up the vintage, olden days feel. Many of the shops here are selling antiques. This place actually kinda reminds me of Jonker Walk in Malacca, so many cars too! The driver recommended this food court place called Lock Tien for lunch. He said that many locals come here to enjoy the local food plus, it's cheaper than most places. Besides the food in the photo we also ordered pork satay, fried rice, Thai iced tea, etc..
After lunch we.... yeap, you guessed it - ate again. Hahaha. It's not that we were hungry, our driver recommended this Kopitiam Restaurant so thought we'd try it. The tomyam here is really good and the ice dessert was just perfect for a hot day. We headed back to Phuket Town in search of a massage place, so tired from all the walking (and eating). I don't really fancy massages, so I just opted for a pedicure while the rest of my family did leg massage. Soon it was dinner time again and OH MY GOD I LOVE THE BANZAAN NIGHT MARKET! There were so much fresh and cheap food here, especially seafood. Check out that oyster and crab which you can cook in any flavour you want 😍 In fact, we loved the night market so much that we went back the next night again. My mum fell ill the next night so we actually left her in the hotel and went out to eat seafood lol. 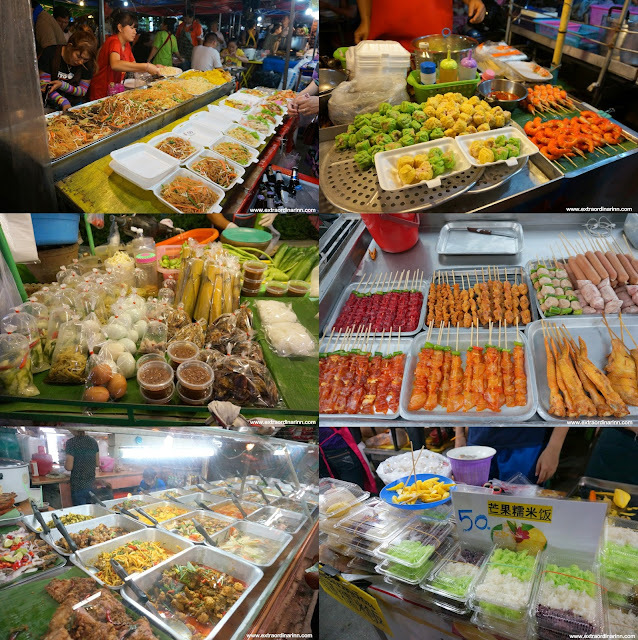 This night market MUST MUST MUST visit! Some of the very common street food you will find here are grilled marinated pork or chicken skewers, mixed rice and unique desserts. I even saw a stall selling crocodile meat! 😨 Just a heads up, it's open air, so you might wanna consider bringing an umbrella along. We were caught in the rain just as we finished our meal but luckily, our hotel was just at the next street so we managed to run back in time. One of my favourite Thai dishes besides tom yam is this Thai Noodle. The thin vermicilli is cooked with chicken or beef broth, and hasadded condiments like chicken drumstick, fishball or pork slices. There was a stall near our hotel so we had our breakfast there. Basically, you can find Thai Noodles (or Boat Noodles) like these anywhere and anytime. You are also given pickled green chilli, fish sauce, chilli flakes and sugar as condiment which you can add to your soup according to your preference. I love to make mine super spicy and sour hehe. If you didn't already know, I love Thai convenience stores - specifically FamilyMart. I can't help but want to go in and check out what kind of instant food and unique alcoholic drinks they offer. Btw, alcohol is so cheap in Thailand that you won't want to buy water lol. So yeap, we had a lot of different types of booze and cocktails there that you can't find in Malaysia. Every morning I'll try to get a mini market onigiri and collagen beauty drink from the convenience stores, cos the collagen drinks there look so tempting! These kind of drinks are really popular in Thailand, they claim to help give you good skin and what not. I don't know if it's true, but look at the sakura pink bottle, too cute to resist lah! Next, we went back to Patong Beach to chill. Took another slow walk and this time we decided to pack some food to have a picnic at the beach. We got some papaya salad, grilled fish, corn dessert and alcohol to chill by the sea and do some people watching. Most people visit the beaches in Phuket to do watersports and parachuting. There were also a lot of people offering hair braiding and henna services, but they are SO expensive! Went back to the hotel again to rest. Day 3 was basically a super chill day for us lah. The rooftop pool area at Sira Grande Hotel is quite small and simple, but still relaxing nevertheless. We bought MORE grilled catfish back to enjoy (seriously, can't get enough of the bplaa dook!) I took some pics for my sponsored swimsuit post here too haha. The service at the hotel is seriously quite good. They even helped me get stamps and send out the postcards that I got for my friends! Last stop was one of the bars at Bangla Road to enjoy some cocktails before flying back the next day. Really love this area, but it's a bit 18SX lah, if you know what I mean.. Hahaha. There are many live bands around the area, everywhere just feels so lively and fun. Be wary of the people who try to sell you souvenirs and always watch your bag too! So this sums up my 4D3N trip to Phuket. Sorry, no Day 4 itinerary cos we flew back kinda early in the morning haha. It was super relaxing and spontaneous cos we didn't really have a fixed itinerary - just the way I like cos we get to explore a bit more. It's totally my idea of a relaxing holiday. I'm actually in the midst of looking for cheap flight tickets for my birthday trip in February now, and Traveloka deals are really tempting me! YOU SEE!! It's only RM129 to fly during my birthday (it's on Feb 6, in case you wanna send me a present :p Jkjk). I'm so tempted to book now and take a flight from Kuala Lumpur to Phuket with my bf before he starts his housemanship! Should I? Anyway, don't say I never share cos the deals are really good, you should book now too for a short vacation with your friends or family! wah banyak resolution this year babe! Haha, yes! It's good to have something to work hard for and look forward to!